The devotee named as VAASTU PURUSHA, lay down in all the sites. He is surrounded by the celestial beings thus he is called the God of Vaastu . These celestial beings sat on the devotee and laid force on different limbs of the Vastupurush. The thirty-two celestial beings are seated on the outer limits and 13 beings are seated within inner limits. A site of any shape can be divided using the VastuPurush Mandala .Each division within the mandala is called pada and an image of the devotee called VaastuPurusha is drawn in the likeness of man. 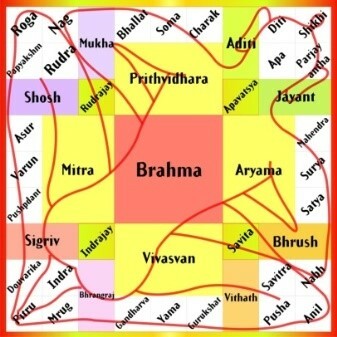 There is 45 pada in Ekashiti Vastu mandal. Each pada is named after celestial beings. 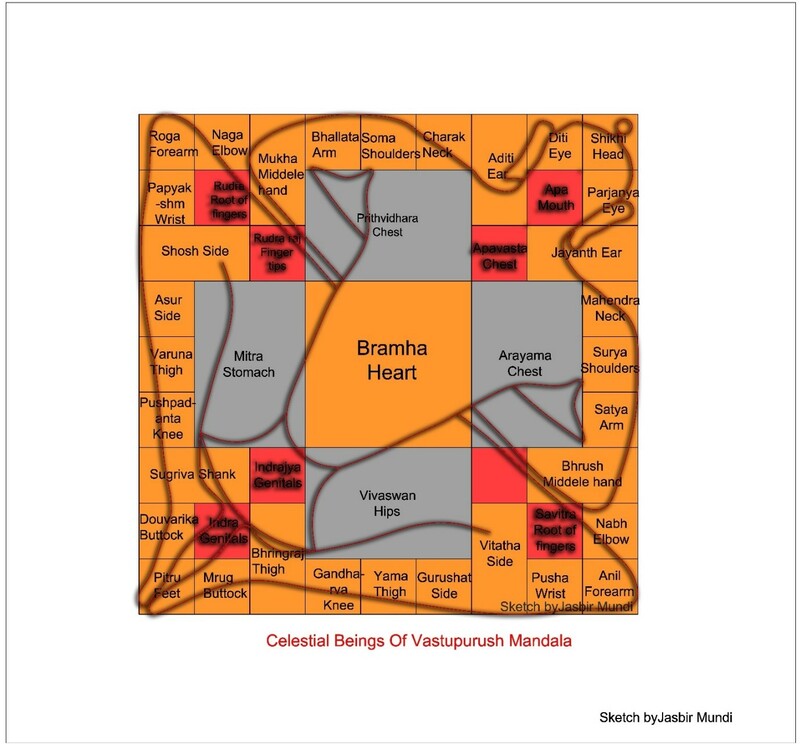 Manasara talks about 32 types of VastuPurusha Mandalas/PadaVinyasa, depending upon their applications such as residential buildings, palaces, auditoriums, temples etc. The deities on outer mandala are important as main door entry of building or plot will be there. The inner deities are mostly related to health issues. The zones on mandala are useful for planning the locations of various activities in a house according to elements present in related zone. Any extension or retraction in the plot or construction site, results in imbalance of it, hence Vastu rectification is needed to balance it.